This is what I’m wearing today. 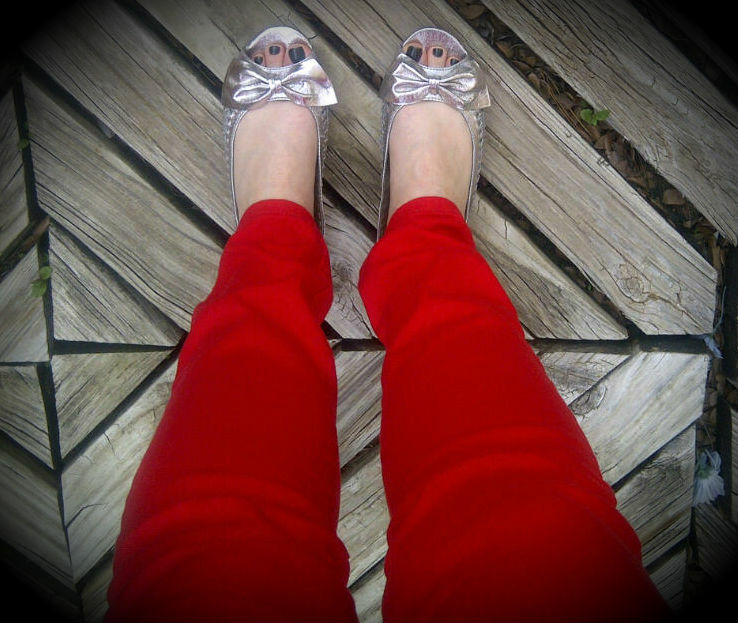 Red jeans. That’s right. But don’t be jealous. You too can have red jeans. soooooo cute!!! I tried on a red cord skirt at Kohl's yest… it wasn't a good enough cut for my er… body. Oy. Sometimes Kohls is just the devil. Try again in a week and I'm sure it will fit better! PS: I didn't realize how freking PALE my feet are. Hurry up, sun!!! Too, too cute, especially with the polish and bows. And I'm sure you're rockin those jeans. I don't love wearing flats. I wish I was in heels. Then I'd really be rockin.